Apple may not toot its own horn when it comes to charitable contributions, but that isn't stopping (Product)RED from announcing the iPhone and iPad maker has already given the organization over US$70 million to help fight AIDS worldwide. That money came via special (Product)RED versions of the iPod lineup. 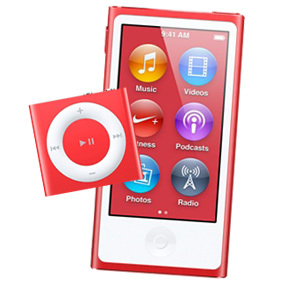 Apple has been a RED partner for some time and has offered several iPod models in red versions over the years. Part of the proceeds from the sale of those iPods goes back to help fund the (Product)RED project. Currently, the iPod touch, iPod nano, and iPod shuffle are available in (Product)RED versions.